Situated in the North West of the city centre, located on Shakespeare Street, near the intersection with Maryhill Road, the Ruchill Church Halls are well worth a visit. The Hall’s location beside the canal means that it is a perfect stopping off place for anyone enjoying a walk along it's picturesque banks. The Ruchill Free Church Halls were completed in 1899. While more conservative than some of his later works, the Halls display Mackintosh's trademark style and his art nouveau motifs are scattered throughout the building. With stain glass windows and flower patterns etched in the doors, the design resembles that of the Art School. It consists of two halls & two committee rooms which are used by todays' active church congregation. Ruchill Church Hall built in 1905 sits adjacent to the Hall. 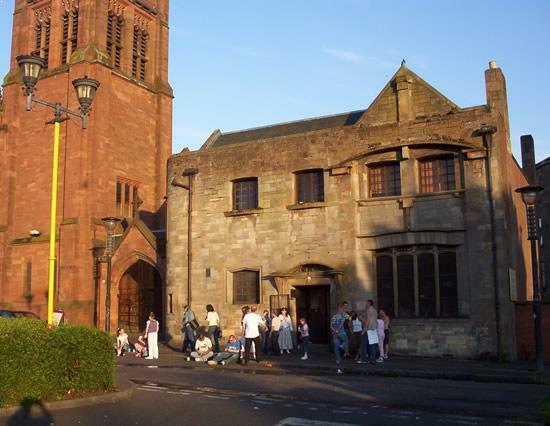 The church uses the Halls for meetings and also runs a Mackintosh Tea Room in the main hall which means you can relax with a cup of tea and a snack and enjoy the architecture. The Halls have not been modernised so you can view it as it was a hundred years ago.